"As many as 183 flights have been cancelled since last night besides dozens other diverted to nearby airports due to the prolonged closure of the main runway in the wake of the SpiceJet aircraft incident," a source said. 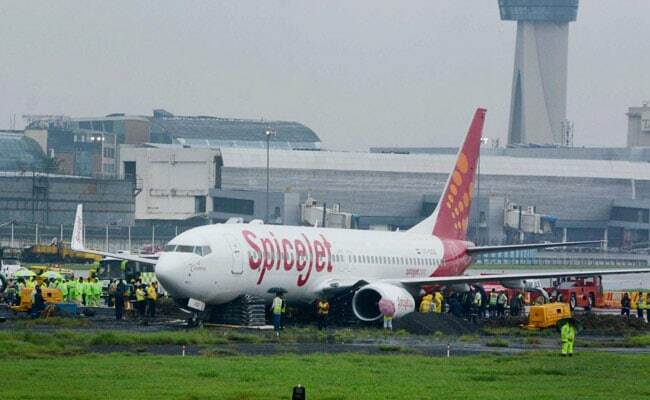 Mumbai: Over 180 flights at the Mumbai airport have been cancelled since last night due to heavy rains and closure of the main runway after a SpiceJet aircraft skidded off the runway and got stuck in mud, blocking it. The aircraft has still not been removed from there and operations on the main runway remain suspended. According to airport sources, NOTAM (Notice To Airmen) has been extended till 6 am tomorrow, which means flights will continue to operate from the secondary runway, which has limited aircraft handling capacity. NOTAM contains information concerning the establishment, condition, or change in any facility, service or procedure, among others, in airspace management. "The process of removing the stranded aircraft from the runway is going on for last 22 hours with the help of Air India but to no avail," the source said. Till 5 pm today, 63 flights of the Jet Airways, eight of IndiGo, two of SpiceJet and one of GoAir were cancelled, a statement from the Mumbai airport said. As many 56 flights were diverted to nearby airports till this morning. The airport operator said efforts to tow away the stranded aircraft and clear the runway have been hampered due to incessant rains. "The process of removing the aircraft has been affected due to continuous rains, resulting in soft soil in the area. NOTAM for closure of main runway is being extended up to 6 am tomorrow," a Mumbai International Airport Limited (MIAL) spokesperson said. Minister of State for Civil Aviation Jayant Sinha tweeted, "#AI team assisting #RescueOperation in removal of #SpiceJet acft from #BOM runway, the only airline in India to offer this type of facility." A SpiceJet plane carrying 183 passengers on board from Varanasi skidded off the runway while landing at the Chhatrapati Shivaji International Airport here at around 10 pm yesterday amid heavy rains and got stuck in the mud. Following the incident, the airport authorities moved the operations to the secondary runway. Mumbai airport, which is the second busiest in the country, has two crossing runways- 09/27 (the main) and 14/32 (the secondary runway). Following the closure of the main runway and subsequent cancellation of flights, several domestic airlines decided to waive off airfare penalties for passengers travelling to or from Mumbai for a particular period. Torrential rain battered Mumbai and its suburbs for the second day today, causing massive disruption in flight operations, delaying suburban train services and forcing a large number of people to stay indoors.